Philips Sonicare HX6311/02 vs HX6311/07, Which Is The Best For Your Kid? Jabra Sport Pulse vs. SMS Audio BioSport: Which of These Sports Earbuds Is Best? Fitbit Aria vs. iHealth HS5 vs. Tanita BF680W – Which Should You Buy? We’ve already compared two of the most popular Wifi scales and body analyzers, the Fitbit Aria vs. Withings. In this post, we extend our comparison to look at more scales and body analyzers. We will be looking at the difference between the Fitbit Aria vs. iHealth HS5 vs. Tanita. Analyzes weight, body fat and BMI. Automatically uploads and syncs data through your Wifi network to the Fitbit app. Analyze your weight loss progress with ease using a web based or smartphone application, which is available free. Stores data for up to 8 people. Automatic recognition for each user. If you have a Fitbit activity tracker, you can connect it to your scale for maximum results. Click here to learn more about the Fitbit Aria, read the customer reviews and buy it. Measures 9 body components: weight, body fat, lean mass, muscle mass, bone mass, body water, daily calorie intake, body mass index, and visceral fat rating. Ability to log calories and activities. Supports up to 20 users. Uploads data automatically via WiFi to the MyVitals app, available for iOS and Android devices. Set goals and reminders or share your results with friends, family or a doctor. 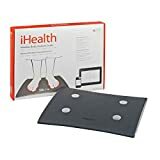 Click here to learn more about iHealth HS5, read the customer reviews and buy it. Analyzes weight and estimates body fat and body water. Stores data for up to 2 users. Estimates how many calories a user should take to maintain current weight. Recalls previous readings for comparison. This is NOT a smart WiFi scale. 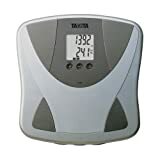 Click here to learn more about the Tanita BF680W Scale, read the customer reviews and buy it. Fitbit Aria vs. iHealth HS5, What’s The Difference? Share your results instantly with friends, family or your doctor. With aria each account is password protected so you can control how much and what data to share. The Fitbit Aria analyzes 3 components: Body weight, fat and BMI. Both scales connect to your local WiFi network. Fitbit Aria: uploads data to a smartphone app, iOS and Android compatible. It also uploads to a web based application that you can view on your browser. iHealth HS5: uploads data to a smartphone application, iOS and Android compatible. Fitbit Aria: 8 users with automatic recognition. iHealth HS5: 20 users with automatic recognition. Which Is Best To Buy, Fitbit Aria or iHealth HS5? Looking at the specs of the iHealth HS5 would make you lean towards it as your scale of choice. It analyzes more body components and supports more users. However, bases on customer reviews, we do NOT recommend it over the Fitbit Aria. Customers have reported problems with WiFi connectivity, and customer service of iHealth are not quick to help. For these reasons, we’ll recommend the Fitbit Aria. Fitbit Aria vs. Tanita BF680W, What Is The Difference? The Fitbit Aria is a smart Wifi connected scale. As we’ve mentioned, it automatically analyzes and uploads your data for further analyzes of your progress online. On the other hand, the Tanita is not a smart scale. 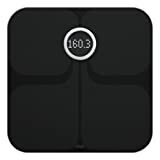 It does have the ability to analyze your body weight, fat and water weight, but it does it all on the scale itself. The data is viewable through the LCD display and can be recalled in the same way. If you’d like deep analysis of your weight progress, want easy to read graphs and goal settings features, then Fitbit Aria is what you need. If you want a simple reading of your current weight, fat and water weight without the additional analysis features, you’ll find the Tanita to be useful.